In 1975 the Swedish Topstar Harpo (born Jan Torsten Svensson) and his song “Moviestar” became world famous. What followed were more Hits like “Motorcycle Mama”, “Horoscope”, “Rock’n’Roll Clown”, “In the Zum Zum Zummernight”, “Television”, “London” and other songs. Especially during the high time of Vinyl records, Harpo was well known for exceptionally good B-Sides. Songs like “Jessica”, “Chelsea Lady” or “Secret Silver Box” were played almost as often as the actual singles. In August 1980 Harpo´s musical career was interrupted by a bad accident with one of his horses, but as soon as he was well enough he returned to his music and continued to write songs. In 1988 one of his best-known albums, “London” was released, sadly only in Scandinavia. 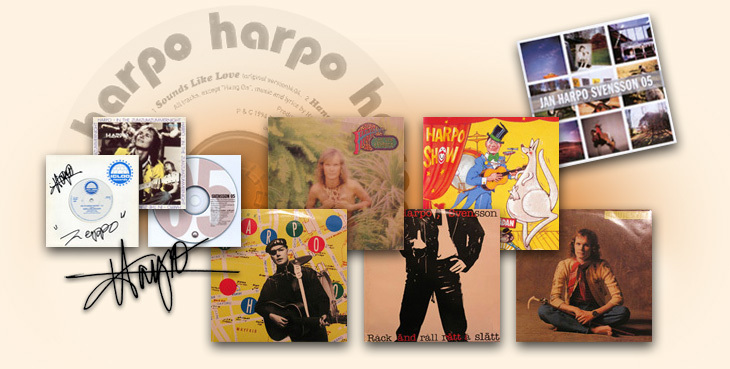 To this day Harpo has released 14 albums in English and Swedish. Thereby Harpo dares other ways and published with “ JanBanan “ and „Harpo Show – Hemliga låden“ two album for children that belong in Sweden to the best-selling children’s albums . Another highlight was the punk-single “Ode to Johnny Rotten” which was released at the end of the 70s under the pseudonym of “Zeppo & The Zepp-Zepps”. Today, Harpo lives on a farm in the Southern part of Sweden and breeds race horses. But music is still a major part of the now 64-year old´s life. Soon his first German song – “Der Magier von Katmandu” (“The Magician of Katmandu”) will be released. In addition he is also working on a Comeback-album. Which means we can look forward to a lot of new songs from the world star Harpo. I still remember very clearly at the time of my first favorite song – that was „Movie Star“! In a large family grew up , we had to start just a radio at home. Every Wednesday night I sat of 20 clock to 24 clock harnessed to the radio and heard at the SWR1 request concert because I knew that the song „Movie Star“ was almost always played! Your music has accompanied me to this day all my life ! Whether in private good or bad times , your music was always there. Either for the good times to celebrate, or even building when it privately were not going so well! I thank you wholeheartedly for the almost innumerable great songs that you wrote! Especially for the past 10 years! You are a wonderful person! Stay as you are and get us hopefully a very long time! I ‚m looking forward to the next new songs from you! All the best to your 40th anniversary on stage! I hope my English is not so bad! Ich freue mich seit 20 Jahren mit einem so einzigartigen Menschen wie Harpo zusammenarbeiten zu dürfen! Herzlichen Glückwunsch zum 40-jährigen Bühnenjubiläum & alles Gute für die nächsten Jahrzehnte, auf dass Du uns noch lange erhalten bleibst. We hope to see you on many concerts again next time, never stop makin‘ music, then you’re forever young. We’ll continue playing your great songs in our radioshow. Ich wünsche Dir zu Deinem 40 jährigen Bühnenjubiläum alles Gute. Bleib schön gesund, damit wir noch lange deine wunderbaren Auftritte genießen können. Wir wünschen dir alles erdenklich Gute zu deinem 40jährigen Bühnenjubiläum! Danke für viele tolle Songs und viele tolle Momente in den vergangenen Jahren bei deinen Auftritten. Bleib so wie du bist – du machst das Leben etwas bunter! auch ich möchte Dir natürlich zu Deinem 40 jährigen Bühnenjubiläum ganz herzlich gratulieren. Bleib vor allem gesund . Ich hoffe das ich Dich noch einmal bei einen Konzert sehen kann. alles Gute zum 40. Bühnenjubiläum. Das Konzert im Hamburger Tibarg war spitze Ende Februar. „Horoscope“ ist und bleibt mein Lieblingslied; neben dem Irdischen gibt es eben auch noch etwas zwischen Himmel und Erde, was unerklärlich bleibt. Gute Gesundheit und viel Erfolg, Harpo..
herzlichen Glückwunsch und vielen Dank für die tollen Songs die Du uns beschert hast. Du bist und bleibst mein absoluter Lieblingssänger. Mach bitte weiter so und bleibe gesund und munter. und ich hoffe, es werden noch einmal 40 !!! You want to congratulate Harpo? Please send your congratulations through this form.